Powers/Abilities: While Dr. Necker doesn't have any superhuman physical attributes or powers, she has extraordinary genius in multiple intellectual areas. She is a certified genius with a PhD in robotics and possesses vast knowledge in engineering artificial intelligence, computer science, computer vision, cybernetics and advanced weaponry/weapons engineering. She is also a skilled biologist and neurosurgeon. Utilizing 21st century Earth-8410 technology, she often wears bulletproof body armor and a visor with various scanning capabilities and breathing equipment. 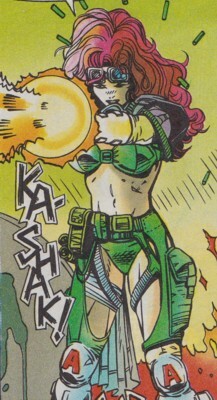 She is trained in the use of a wide array of advanced energy weapons and explosives, and has some hand to hand combat training. Using hand-held time discs and similar teleportation devices, she can teleport through time, space and realities. 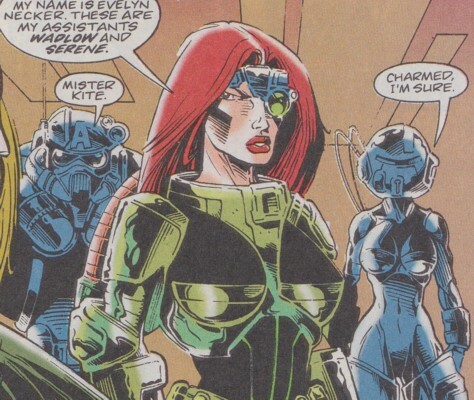 (FF: Fifty Fantastic Years#1) - Evelyn Necker was born to British high-tech mercenary Stealth (Eliza Necker), leader of the Requiem Sharks, and her teammate Smart, who embraced their love for each other after meeting a time-traveling adult Evelyn. (FF: Fifty Fantastic Years#1) - Note: Due to her parents appearing on Earth-616 without a child only a few years before an adult Evelyn joined Project: PEGASUS it is very likely her parents raised her in Earth-616's past or another reality. (FF: Fifty Fantastic Years#1) - Raised by her loving parents, Evelyn excelled in many scientific fields and, after gaining a PhD in robotics, was approached by her parents' former employers AIM (Advanced Idea Mechanics). (Nova IV#23 (fb) - BTS) - Necker sometimes worked for AIM believing they were about working for a better world, lead by science. (Nova IV#17 (fb) - BTS) - Necker became robotics head at Project PEGASUS. As such she was line chief to Robert Rider, brother of Nova (Richard Rider). She used the Warguards data collected at PEGASUS to start the Minion project. (Nova IV#18 (fb) - BTS) - However, Necker didn't have a reliable power source to activate the Minion project. (Nova IV#17) - Six weeks after the extraction of the exotic radiation, Skrull's invaded Earth and targeted PEGASUS. Necker helped remove and reboot the Xandarian Worldmind from Nova and placed it inside an experimental gestalt mainframe intended for the Minion project. The quantum flask opened, releasing Quasar. (Nova IV#18) - As Necker and Robert collated data on what had happened, the Worldmind appeared to them. It activated the Minion project in defense of PEGASUS. (War of Kings: Darkhawk#1(fb) - BTS) - Necker dealt with booby traps left over from the Skrull invasion. (Nova IV#19(fb) - BTS) - PEGASUS became a temporary base of operations for the newly reformed Nova Corps, and Necker became attracted to Richard Rider. (Nova IV#19) - Necker greeted Richard as he returned from an encounter with the Serpent Society. (War of Kings: Darkhawk#1(fb) - BTS) - Necker was dealing with a Skrull booby trap when it caused a blast that temporarily shut down the PEGASUS containment grid. A couple of the U-Foes escaped their cells. (War of Kings: Darkhawk#1) - Necker informed Darkhawk of the U-Foes escape, only moments before they were approached by Vector. Darkhawk dealt with the villain, but his amulet began playing up. Necker reached out to him, and was struck down for her troubles. He quickly apologized, and fled for fear of doing more harm. (Nova IV#22 (fb) - BTS) - Necker and PEGASUS monitored the Worldmind's mass recruitment of thousands of people worldwide. (Nova IV#22) - Necker, Quasar and Director Gruenwald of PEGASUS met with Richard Rider, who had been stripped of his powers, to discuss the Worldmind. Rider asked them to test him for signs of mental instability caused by his long term possession of the full Nova force. Gruenwald proposed using an isolation chamber to isolate and study a Nova centurion for signs of the Worldminds manipulations. Rider suggested Necker lure one in. (Nova IV#22 (fb) - BTS) - Rider's tests showed him to be mentally healthy. Necker contacted Robert Rider, who was dealing with a hurricane with fellow Nova centurion Irani. (Nova IV#22) - Necker lured the two Nova centurions into the isolation chamber, where Rider revealed himself to them and explained the situation. They quickly realized that they had been cut off from the Worldmind, who had been subliminally manipulating them. Other Nova centurions arrived to investigate, bursting through the chamber wall. Robert and Irani fell under the Worldminds influence again, and left with their comrades. (Nova IV#22 (fb) - BTS) - Necker saw the results of Richard Riders biopsy results. (Nova IV#22) - Necker informed Richard that his body had suffered long term damage from containing the full Nova force, causing irreversible molecular decay that would kill him in under 48 hours. (Nova IV#23 (fb) - BTS) - Necker and Gruenwald worked on a means of fighting Richard molecular decay. However, PEGASUS was taken over by HAMMER. Gruenwald was suspended. Necker was fired and informed her contract wouldn't be renewed. She secretly took Quasars cosmic flask, planning to give it to AIM. (Nova IV#23) - Necker pretended Richard Rider was her boyfriend when she saw him being hassled by HAMMER security guards. She was forced to hand in her swipecard. She drove Richard to an unused AIM installation to continue working on stopping his molecular decay. Richard refused her help, knowing AIM were terrorists. Nonetheless, she gave him Quasars cosmic flask. Richard and Necker kissed each other. However, concerned it would fall into the wrong hands, Richard tried to break the flask causing Quasar to appear. Quasar gave Richard the quantum bands. (Nova IV#36 (fb) - BTS) - Necker returned to PEGASUS after HAMMER was disbanded. (Nova IV#36 (fb) - BTS) - Necker and other PEGASUS staff were secretly possessed by parasites from the "Cancerverse" (Reality-10011) led by a dark version of Quasar. Nova contacted PEGASUS to consult with them over the danger represented by the Fault, a tear in space and time. He arrived to investigate when he learned that the facility was in lock down. (Nova IV#36) - Necker directed Nova and Quasar as they lifted a piece of heavy machinery into place. Later, under the control of the parasite, she ordered Guardsmen to kill Nova. Nova survived their attack, and fled taking Necker with him in a gravity bubble. The bubble cut off the parasites control. He was able to free Gruenwald from his parasites control too. Nova shut PEGASUS's Horrorscope portal and killed the creature controlling the parasites before leaving to track down the "Cancerverse's" Quasar. Necker remained behind to tend to a wounded Darkhawk and get PEGASUS back up and running. (Revolutionary War: Death's Head#1 (fb) - BTS) - Necker left PEGASUS, apparently having been offered a deal by Psycho-Wraith Prime and his mysterious master to work on the Minion project for them in order to create an army of cyborg killers. AIM funded the project, while Psycho-Wraith Prime's master provided Necker with a base at the Darkmoor Research Centre. She used the alien Warguard technology mixed with AIM know how to build more Warguard style cyborgs. To further the project, she was offered the chance to study and dissect Death's Head (Minion) for twenty four hours, unaware that he was one of her future creations. (Revolutionary War: Death's Head#1) - The Psycho-Wraith Prime haggled with Necker as to how long she could study Death's Head (Minion). He gave her four hours. Necker whispered to herself that she had only needed two hours as Psycho-Wraith Prime disappeared. She used nano-probes to reveal Death's Head's secrets. She learned of Death's Head the Freelance Peacekeeping Agent, and how he had been assimilated by Minion and become the cyborgs dominant personality. She was also informed that the cyborg had saved the world from Charnel. Her work was interrupted when Death's Head's predecessor arrived with Tuck. Necker used the nano-probes to control Death's Head (Minion) and make him fight his former self. Tuck threatened to blow Neckers head off if she didn't stop controlling Death's Head (Minion), but Necker insisted it was too late. When the earlier incarnation of Death's Head stabbed his successor in the head, Necker decided she should be studying the earlier version instead, and activated her Warguard style cyborgs, calling them Death's Head 3.0. However, Death's Head (Minion) rebooted, recovered, and regained control of himself, prompting Necker to flee. She hid in an alcove and operated a remote control unit for her cyborgs, but it was severed in two by Tuck's sword. Necker fled once more as one of the Death's Head 3.0 cyborgs launched itself at Tuck. With the remote destroyed, she needed to resolve the situation manually. See comments. (Revolutionary War: Death's Head#1 (fb) - BTS) - Necker found a large ambulatory tank-like vehicle armed with a really big concussion cannon. This vehicle looks very much like the one used by Reaver ... See comments. (Revolutionary War: Death's Head#1) - Necker came crashing through a wall with the vehicle and blasted both Death's Head (Minion) and his earlier incarnation. Activating the base's self destruct, she collected her research and had her AIM associates prepare the earlier incarnation of Death's Head for transport. She reasoned that by the time the Psycho-Wraith's had finished with him his later incarnation would never have existed. (Death's Head II#1 (fb) - BTS) - At some point, Necker started working for AIM on the alternate Earth-8410. (FF: Fifty Fantastic Years #1) - While working for AIM, Necker used the Warguard data collected at PEGASUS to start Project: Minion. (Death's Head II#1 (fb) - BTS) - In the timeline of Earth-8410, A.I.M. 's pre-cognitive division informed their executive division of their prophecy that an unrevealed threat would obliterate them in the near future. To prevent this they agreed to fund Necker's Minion project for their defense. (Death Wreck#1) <October 1, 2018> - AIM told Necker that she needed to light a fire under Project: Minion and get a cyborg up and running ASAP or she would lose her funding. While she had estimated five years until expected completion, she was forced to cut a few corners to get it completed within the month. Rather than using a cold fusion or other nuclear power device as she might have wanted, she went an internal combustion engine, taken from a 1992 model automobile. (Death Wreck#1) <October 12, 2018> - Dr. Necker and Duffy completed the Minion cyborg, but as her project hinged on the successful use of Bio-Organics, she needed a human brain. (Death3 #1(fb) - BTS) <October 12, 2018> - Controlling Minion under voice command, she took him out into an alley where they found a homeless alcoholic man. In an effort to catch the man, Minion nearly crushed him. Necker stopped him in time and instead shot and killed the man. She then rushed both Minion and the "donor" back to A.I.M., where she transplanted the donor brain into her cyborg. (Death Wreck#1) <October 13, 2018> - Dr. Necker loaded Minion up with fuel and activated him. Surprisingly enough, Minion awoke with the mind of a drunkard and began swinging wildly, breaking Duffy's nose, before Evelyn could calm him down. While she began figuring he'd be ok after he had a few days to dry up, Minion began searching around for something to drink. He stumbled across Dr. Necker's time disc, which he activated, sending him to the future of Earth-928's 2093 AD. (Death Wreck#3) - Dr. Necker, having managed to trace Death Wreck's time disk, traveled to Earth-93122's New York circa 2053 AD in time to save Death Wreck from Dredge, a futuristic cop who tried to bring Death Wreck in. She then prepared to take Death Wreck back to Earth-8410's 2018 AD with her, but he again activated his own disk, heading forward to Earth-9413 circa 2159 AD. Before she could follow him, Dredge attacked her from behind and gave her the beating of her life. (Death Wreck#4 (fb) - BTS) - Dredge nearly strangled Necker, but she managed to nail him with "a copious supply of tranquilizing darts" and escape back to her lab in 2018 AD. (Death Wreck#4) - In Earth-928's 2085 AD, Dr. Necker traced Death Wreck again and found him in Burgen's holding cell. She instructed DW to come with her, but he refused to leave without his new friend Olivia de Diamond, and threatened to activate his time disk and escape from her once again if she tried to force him. Evelyn conceded to him, and DW broke out of his cell and located Olivia. Burgen tried to hold Olivia hostage, but she kicked him into his Gene Pool, which was a device that kept him eternally young and healthy. Evelyn blew up the Gene Pool's generators as they teleported away, and Burgen was mutated into a hideous mockery of his once-perfect form. He swore vengeance on Death Wreck if he ever met him again. Evelyn brought Death Wreck and Olivia back to Earth-8410's 2018 AD, where she downloaded his memory banks and made copies of his operating system for the next Minion. She then prepared to dismantle Death Wreck, whom she considered a failure, but Olivia cold-cocked her and knocked her out. She then revived Death Wreck, and they teleported away together. (Death's Head II#1(fb)) <2020 AD> - Dr. Necker created the next Minion cyborg. She sent Minion out to acquire the instincts of 106 of the most deadly individuals in the galaxy. (Death's Head II#1, Death's Head III#9 (fb)) - Minion returned from a mission and displayed a flippancy that worried Dr. Necker. He mentioned that he had encountered the mechanoid Freelance Peacekeeping Agent known as Death's Head's on his last mission, before vanishing off on his next one without her consent. Dr. Necker had Gaffney get a fix on him with the continuum tracker while Sebble called a virtual reality conference of A.I.M. 's executive committee. She gave them a progress report and asked for more backup facilities and a higher budget. The conference tied her up longer than she would have liked, and on her return to the project lab she asked after Minion's progress. The cyborg was mid-jump on a time-loop through Zeta Reticula circa 2456 AD while hunting Lehdrox. The fact that the length of the mission had been estimated at seventeen minutes, and he was overdue by nine minutes, concerned Dr. Necker. When Minion returned, he was followed by Death's Head. Minion assimilated the mechanoid's instincts, but they began to overload his systems. He teleported after his next target, Reed Richards, aka Mr. Fantastic in Reality-616's modern era. Dr. Necker prepared to follow him. (Death's Head II#2) - Dr. Necker found Reed Richards at Le Maison St. Jaques, a French restaurant in Manhattan, only shortly before Minion arrived. As Necker and Reed fled, she explained about the Minion project and how the cyborg had assimilated Death's Head's instincts. Reed remembered Death's Head from their many previous encounters (see comments). Dr. Necker slowed Minion down briefly with a bomb, which attracted the attention of Ben Grimm, aka the Thing. While Ben attempted to slow down Minion's progress, Necker and Richards went to Four Freedoms Plaza. Reed theorized that the reason the assimilation process had gone wrong with Death's Head was because as a mechanoid his instincts were part of his self, and so the Minion cyborg had not only absorbed his skills, but his personality too. He set up a machine to bring Death's Heads personality to the fore. As Minion approached, Dr. Necker gave Richards a kiss on the cheek, saying what a privilege it was to have met him in the flesh. The machine worked, and Death's Head's personality started to gain control of the Minion cyborg. He assimilated all data known to Richards from the computer mainframe and time jumped away before Necker could stop him. She time-jumped after him, asking Reed to remember her fondly. As the remaining members of the Fantastic Four entered the laboratory, Reed's wife, Sue Richards, noticed Dr. Necker's lipstick on Reed's cheek..
(Death's Head II#3) - Dr. Necker traveled to Lionheart to find Death's Head. She met with the Lord High Protector in order to gain information on the outlaw, Hood, who she suspected was Death's Head. She watched as Major Oak and his men ambushed Hood (who was indeed Death's Head). Knocking the Lord High Protector out with a sword, she blasted Major Oak from behind with a big gun in order to save Death's Head. She convinced him to return to A.I.M. central with her. However, by the time Death's Head, Necker and Tuck had reached the installation Charnel -- necromancer Baron Strucker V who had merged with the Death's Head mechanoid's remains -- had already devastated it and time jumped into the modern era to destroy A.I.M. 's past. (Death's Head II#4) - Death's Head, Necker and Tuck traveled back 28 years in time, arriving at a Manhattan shopping mall (within the former World Trade Center), which would one day be the site of A.I.M. central. They encountered a group of Avengers from the alternate future of Earth-9939. Together they fought Charnel, but during the conflict, the villain absorbed energy from the alternate Scarlet Witch and became even more powerful, turning into the creature that would devastate the future she had come from. Death's Head placed a second time belt on Charnel and, using what was left of her hex power, the Scarlet Witch activated them both. Charnel was torn in two, one half flung into prehistory, the other into the thirtieth century. With her timeline seemingly negated and her fellow Avengers dead at Charnels hands, the Scarlet Witch vanished. As Death's Head and Tuck prepared to depart, Dr. Necker inquired where they were going. Death's Head stopped and reminder her that he was no longer subject to her programming. Furthermore, he told her that if she hadn't built the Minion cyborg and allowed it to kill his original body, Charnel would never have been able to use it to cause such destruction. Shortly after Death's Head and Tuck left, the Avengers of the modern day arrived, but Dr. Necker time-jumped away and avoided Captain America's questions. (Death's Head III#10 (fb)) - After returning to the modern era of Earth-616, Dr. Necker spent six weeks scouring A.I.M. 's Ice Borg archives for a potential host body for a new Minion cyborg and chose Kite from a shortlist of ninety potential candidates. (Death's Head III#2) - As Kite wandered from Paxton, Oregon, towards Chicago, Illinois, in pursuit of the Sapphire Lotus, Dr. Necker and an assistant located and began observing him. (Death's Head III#3) - They were still observing him when the trail of the Sapphire Lotus vanished as it was teleported into another dimension. Still, Necker just continued to watch and wait. (Death's Head III#5 (fb) - BTS) - Necker reviewed the recent history. (Death's Head III#5) - Dr. Necker and her assistants observed and tracked the mutant known as Kite during a brawl with several truckers in Illinois, America. (Death's Head III#6) - Necker and her assistants continued to observe as Kite brawled with more people during his travels in America. (Death's Head III#7) - Eventually, they approached Kite in a New York diner, where they fought him. (Death's Head III#10 (fb) - BTS) - They captured Kite and transferred him to Pacific Vista Laboratories, California. (Death's Head III#8) <July 3rd> - Dr. Necker unveiled her latest creation: the endo-frame of a new Minion cyborg she intended to call Death's Head. (Death's Head III#10-12) - Necker observed Kite in his holding tank. She began bragging to her assistant, Serene, about how later that afternoon she would bond Kite to the endo-frame and create the new Minion cyborg. Serene mentioned a series of attacks on A.I.M. 's Ice Borg installations and told Dr. Necker the committee wanted the cyborg on line as soon as possible to counter the attacks (does this plot development sound familiar? if not see comments)! Dr. Necker refused to authorize use of the cyborg until it had been triple-checked, and enquired who might be behind the attack. Serene's description of a mechanoid and a young girl with a crossbow sounded hauntingly familiar... like Death's Head and Tuck to be precise! (Death's Head III#11) <July 4th>> - Shortly after, Kite escaped from his holding cell, only to be stopped by a synaptic disrupter Dr. Necker had implanted in his brain-stem. They took Kite into surgery. Dr. Necker stripped away his flesh and bone and bonded his body to the Minion combat-chassis. On leaving the operating theatre, Serene informed her of a visitor... named Tuck! Necker rushed to meet her in a panic, and questioned her as to why she had come to the laboratory. Suddenly the light of day dawned on Dr. Necker as she looked at the car Tuck had arrived in. As she stood there, Death's Head burst out of the trunk. She ordered the A.I.M. security guards to blast him, but they were stunned by the Requiem Sharks. Death's Head asked who he had been before Necker had murdered his host body and turned him into the Minion cyborg. Serene arrived with more security troops before Necker could answer, and the doctor escaped. Death's Head followed while Tuck and the Requiem Sharks fought the troops. As Death's Head approached, Dr. Necker attempted to activate her new creation, but Kite was gone. When Death's Head learned that the new cyborg had been based around Kite, he started to realize who Kite was. Kite reappeared, bringing his future self with him, merging with him to become Charnel and confirming Death's Head's fears. (Death's Head III#12) - Dr. Necker watched as Death's Head, Tuck and the Requiem Sharks fought Charnel. Smart was struck by one of Charnel's blasts, and his partner Stealth flew down to help him. She asked Dr. Necker for help, and as she removed her helmet Dr. Necker was shocked to realize Stealth was in fact her mother. Furthermore, as they took Smart to safety they removed his helmet too. Dr. Necker had yet another shock when she realized Smart was actually her father. Serene reminded Dr. Necker of the synaptic disrupter in Kite's brain stem, and she activated it, saving Death's Head. While Charnel was temporarily immobilized she set an A.I.M. time-dish to overload in the hope it would destroy the villain. Charnel began to absorb energy from the temporal warp, but a blast from Death's Head made him lose control and explode. When the survivors recovered from the explosion, Dr. Necker was gone, presumed caught in the time-flare. (Death3#1(fb) - BTS) - After six years of working for AIM, four of which were spent on the Minion project to protect them, Necker decided to cut ties with them after the Charnel debacle and began working for Earth-8410's Omni-Corporation. She believed she would be safe from any surviving branches of the AIM organization of that time by sheltering in the protection of a rival organization. 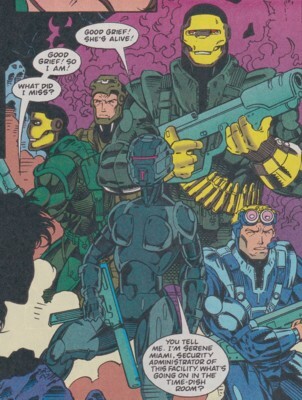 (Loose Cannons#1) <November, 2020> - Necker was working at Omni Megacore Tower, Los Angeles, when she accessed information from the records of Gena-Sys labs. She was filled with admiration for the work of Doctor Oonagh Mullarkey, and excited about a bacterial strain brought to Earth by Virago troop. Mullarkey had named the strain Pandora. (Loose Cannons#2(fb) - BTS) - Necker triangulated Virago's location in the continuum from when they had found the Pandora strain. (Loose Cannons#2) <2021> - Necker prepared for an excursion, taking three battlemech drones. She was accompanied by Abram Stalker of the resource committee, who had been sent by Omni to supervise expenditure. They used time belts to travel to the coordinates Necker had triangulated. They arrived in the middle of a battle between Virago troop and some creatures in the distant future. (Loose Cannons#3) <2390> - Stalker was taken by the creatures, who were actually descendents of the human race. Necker's drones gave herself and the others the chance to retreat to an area that was easier to defend. Unfortunately one of the creatures grabbed at Necker, damaging her time belt, before she could get free. She got to safety with Virago and her drones, and began to explain to the Warheads why she was there. (Loose Cannons#3(fb) - BTS) - Necker and the Warheads examined an archive that they presumed to be an advanced alien device. (Loose Cannons#3) - They discovered that the year was 2390, and they were on a planet Earth that had died due to the release of the Pandora strain in 1994. The Earth had been plunged into a black hole and sealed off from the rest of the galaxy by the Kree, the Shi'ar and the Skrull. Necker realized that the creatures could access the past using Stalker's time belt. Virago decided to go back into the creatures lair to retrieve the belt before going back to their own time to ensure that the Pandora strain wasn't released. Necker and her drones remained with the archive to continue researching with the Warhead called Sphinx. They discovered that the Death's Head (Minion) of the alternate future timeline had been trapped on the Earth, and was believed dead. Necker realized, however, that it was more likely that the cyborg had survived, and began looking for him. (Loose Cannons#4) - Necker correctly reasoned that Death's Head would've retreated to a well protected area and powered down, and soon found him. (Loose Cannons#4(fb) - BTS) - Necker was able to get Death's Head to power back up, and went with him to help Virago troop. (Loose Cannons#4) - Death's Head swiftly defeated the creatures. 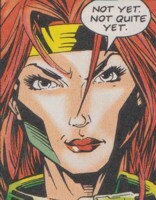 Necker used Stalker's time belt to transport herself, Virago and Death's Head to Omni Megacore in 2021. She made a point of destroying all her information on the Pandora strain and the location of the black hole where the alternate Earth had been banished to. She then sent Virago troop back to their own time, telling them to destroy the information in Mullarkey's possession too. She gave the alternate Death's Head a new time belt, and he left. (Death3#1(fb) - BTS) - Necker took up a new post as the director of Omni's Cybernetics Division. They believed she would advance their bio-weapons program. (Death3#1) <6/11/2021> - Death Wreck returned to Necker, giving her an opportunity to resume the Minion project. Her primary concern was to see if it was the trauma of time-travel that threw out Death's Head's programming and caused him to go rogue. She tried out her time travel device on Death Wreck, sending him to an alternate timeline of Earht-9939. He was immediately attacked by the Spawn of Charnel, and when his time jump returned it to Necker's lab, the arm of one of the Spawn of Charnel was brought back as well. <6/11/2021> - Intrigued by this new metal, which she dubbed "Promethium" (my grubby Prometheus must have stolen it from some cybernetic heaven), she studied it. She determined it to be sentient, and decided to make another attempt to form a successful Minion. <6/15/2021> - She succeeded in replicating the Promethium. <6/22/2021> - Necker articulated the Minion mainframe and assembled the low-light intensifier optics. <7/03/2021> - With the bodyverse systemics at optimal, Necker introduced a cold-fusion cardiac reactor. <7/09/2021> - Necker completed and activated Death Metal, who promptly abandoned his programming and sought to follow the call of his "father," Charnel. He then stole one of Necker's time-displacement units. Necker ordered Death Wreck to stop Death Metal before he could activate the device. However, Death Wreck only acted in time to be caught in the effects of the device as it activated. Both Death Metal and Death Wreck traveled to Earth-9939. (Death3#2 - BTS) - While searching for Death Metal, Death Wreck encountered his other "brother," Death's Head (Minion). (Death3#3 - BTS) - Upon learning that Death Wreck was his "hideous older brother," Death's Head exclaimed that one day he would catch up with Dr. Necker and make her pay. (Death3#4) - Death Metal's promethium form was purged by the Ghost Rider of Earth-9939, allowing him to see clearly for the first time. He allied himself with his "brothers" against the Charnel of Earth-9939, the very foe foreseen by AIM that had led to the creation of the three "brothers." (Death3#4) - Death Wreck ultimately returned to Necker's laboratory at Omni, but there was no sign of Death Metal. Death Wreck promptly asked Necker for something medicinal. Comments: Created by Dan Abnett and Liam Sharp for Marvel UK. Dr. Necker meets Reed Richards, introducing her self as: "Evelyn Necker." Reed Richards: "My mothers name was Evelyn..."
Dr. Necker meets the Lord High Protector of Lionheart and introduces herself as: "Lady Evelyn Clarice Necker of Aym." Lord High Protector: "Clarice? That's my mothers name..."
Dr. Necker meets the Avengers from Earth - Charnel and Captain America exclaims: "As for Evelyn Clarice Sarah Necker, well, Sarah was my mothers name, but that's as far as that goes..."
To which Necker replied: "Shame." Thankfully that was as far as her habit of revealing a new name (that coincidentally was that of somebody's mother) each issue went! Dr. Necker seems to be something of a trouble magnet, if it wasn't for her there would be no Charnel. However, she was rushed her to create her Minion cyborgs (A.I.M. of Earth-8410 did so because of the threat they had predicted, modern day A.I.M. did so to combat the threat of Death's Head) and perhaps with a bit more preparation time she could have created cyborgs that didn't rebel against their programming, or realized that assimilating the Death's Head mechanoid would result in his personality taking over the Minion cyborg. When first seen in the Death's Head mini-series, A.I.M. central in the year 2020 was originally meant to have been built on the site of a Manhattan shopping mall within the former World Trade Center. In the regular series when Death's Head traveled back to the point of his own "creation" (the point at which Minion absorbed Death's Head's personality) A.I.M. central was described as being in Los Angeles conurbation. The two buildings are meant to be the same, but I've no explanation as to why the location was changed. I'm not 100% certain whether the creation of Death Metal was meant to come before or after the reformation of Charnel, but that's where we put it! This placement made it into the official profile in FF: Fifty Fantastic Years -- Changeling. The young Dr. Necker later appeared in the pages of Nova as an employee of Project PEGASUS, and occasional employee of AIM. Our very own Markus Raymond wrote the OHotMU profile that saw publication in the pages of Fantastic Four: Fifty Fantastic Years. 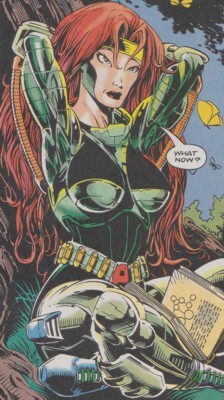 This neatly tied her Nova appearances into the Death's Head ones, although some people online think that the Nova version is a "616" alternate version of the character. While there undoubtedly ARE alternate versions of a time traveling character like Necker out there, I see no reason why this younger version can't have grown up to become the one from the Death's Head II series. Revolutionary War: Death's Head later gave us the reason she left PEGASUS... to work for Mys-Tech's Psycho-Wraith Prime. The younger Necker meets both Death's Head's well before Minion assimilated his predecessor. Perhaps that encounter is the very reason she selected Death's Head to be assimilated. Although she learned that Death's Head would ultimately take over Minion, I feel she is arrogant enough to assume that with foreknowledge on her side she could alter her destiny. It's also worth pointing out that the Darkmoor Research Centre base she uses in Revolutionary War is indeed the same Centre where Brian Braddock once worked as seen in Captain Britain#1. Captain Britain also appears in the issue, although he and Necker don't interact. She does, however, appear to be using the Reaver's ambulatory vehicle. As the Research Centre appears to have become a Mys-Tech base, my guess is they acquired it (and the vehicle) at some point after the Reaver's attack. Alternatively, perhaps Mys-Tech were already involved with the centre or the Reaver prior to the events of Captain Britain#1. The vehicle could well be the same one the Reaver used, or be based on the same designs. I'm not listing Mys-Tech as affiliations, however, as later issues of Revolutionary War show that it was Mephisto and Killpower who were behind the Psycho-Wraith Prime's actions. Also, as far as we know she never dealt directly with anybody other that Psycho-Wraith Prime and never learned the identity of his "mysterious master." I've also added information from the unpublished Loose Cannon's series featuring Virago troop, an all female team of Warheads. Although it was never published, a character called Bo from the series appeared in Revolutionary War: Warheads#1 and confirms that Virago troop existed. The Loose Cannons series is available to read online, though parts of issue 4 are only rough uncolored sketches. Check it out here: Loose Cannons. Thanks to Markus Raymond for the images. Profile By Changeling and Snood. A.I.M. 2020 refers to the organization in the alternate future timeline of Earth-8410 from which Necker created Death's Head (Minion) and should not be confused with the modern day organization or any alternate versions of said organization. any body else's mother who coincidentally shares a name with her! Including Reed Richards mother, the Lord High Protectors mother and Captain Americas mother! A.I.M. 's P.D.C. (Precognitive Data Collection) unit picked up an unrevealed threat (later identified as Charnel - possibly Charnel-9939) which would totally demolish the organization in their near future. The Executive Committee had Dr. Necker step up Project: Minion in order to combat that threat. Her first creation was the alcoholic Death Wreck. Her second Minion cyborg killed the mechanoid Death's Head and assimilated his instincts. While Death's Heads personality eventually came to control the Minion cyborg, his original mechanoid body was taken from A.I.M. central by former partner Spratt. The body fell into the hands of Baron Strucker the Fifth, who used it to become Charnel. Charnel was the threat the P.D.C. had picked up, and he not only demolished A.I.M. central but traveled back in time to attempt to erase their past for turning their corporate back's on the Strucker family. Wadlow and Serene were Dr. Necker's assistants while she worked at Pacific Vista Laboratories. Serene was also Security Administrator of Pacific Vista Laboratories. Wadlow monitored Kite as they flew over Illinois, using hi-tech goggles, watching as he fought and killed a gang of truckers. They followed Kite to a petrol station, and Wadlow observed as he got involved in another brawl. They finally apprehended Kite in Henry's 24 hour diner, New York. After they had returned to Pacific Vista and put Kite in his holding cell, Serene and Dr. Necker began preparing the new Minion cyborg. Serene later relayed a message to Necker from A.I.M. 's committee about a series of attacks on their Ice-Borgs. The committee wanted them to speed up the Minion project to counter the attacks. Later Serene watched as Dr. Necker dealt with the escaped Kite using the synaptic disrupter in his brain-stem. Serene observed while Dr. Necker performed surgery on Kite and bonded him to the Minion endo-frame. As Necker left surgery, Serene told her that her "old friend" Tuck was waiting for her in the basement garage. It soon became apparent that Tuck was not really an "old friend" at all, and that Pacific Vista had been infiltrated by Death's Head and the Requiem Sharks. Serene and her security forces attacked the intruders, but she was knocked unconscious by Tuck. Shortly thereafter, Serene found Tuck wounded from fighting Charnel. Serene ordered her troop to attack Charnel, who in turn incinerated the troops, though Tuck managed to shove Serene out of the way. They met up with Dr. Necker, and her parents (Smart and Stealth of the Requiem Sharks). While discussing possible means of stopping Charnel, Serene remembered the synaptic disrupter in Kite's brain-stem. Dr. Necker managed to temporarily immobilize Charnel with the disrupter, and began to set an A.I.M. time-dish to overload and destroy the villain with a temporal warp. Serene attempted to stop Dr. Necker , but was held at gun point by her mother. Dr. Necker set the dish to overload, and they all ran out of the building as fast as they could. After the overload destroyed Pacific Vista, Serene was left desperately attempting to contact A.I.M. central. As A.I.M. operatives both Wadlow and Serene are presumably skilled scientists. They both used A.I.M. body armor and weaponry and have some formal combat training, particularly Serene who was in charge of Pacific Vistas security troops. California-based Pacific Vista Laboratories was listed as a Plastics Technology operation, in the Salt-tang paradise of the pacific shore. Instead it was an A.I.M. installation. Dr. Necker worked there to create a Minion Cyborg. That cyborg, based around the mutant Kite, merged with "Koot" to become Charnel. A.I.M. 's security forces attempted to stop Charnel, but his destruction obliterated the entire complex.